Researchers working in Africa are the first to observe monkeys preying on bats. The unusual behavior, which may have something to do with loss of habitat, could explain how dangerous diseases such as Ebola spread among species—and eventually to humans. African Cercopithecus monkeys are “opportunistic” omnivores, which means they’ll eat just about anything. In addition to eating various fruits and leaves, they sometimes consume lizards, snakes, birds, and mice. And now, as a new paper published in EcoHealth shows, they also like to prey on bats. This suggests a novel pathway for bat-to-monkey disease transmission. Prior to this study, scientists assumed that monkeys contracted zoonotic diseases—diseases that spread from species to species—by eating fruits contaminated with an infected bat’s saliva or feces. These prolific flying mammals are carriers of several problematic diseases, including Ebola, Marburg, and Henipa. A research team from Florida Atlantic University witnessed a total of 13 bat predation events over the course of six-and-a-half years. The researchers, led by Elizabeth Tapanes from the Gombe Hybrid Monkey Project, photographed and filmed the monkeys as they handled and ate the bats. The monkeys, who often had prolonged contact with bat carcasses, spent up to ten minutes to an entire hour consuming a single bat. In one case, a monkey ate the entire bat—bones and all. 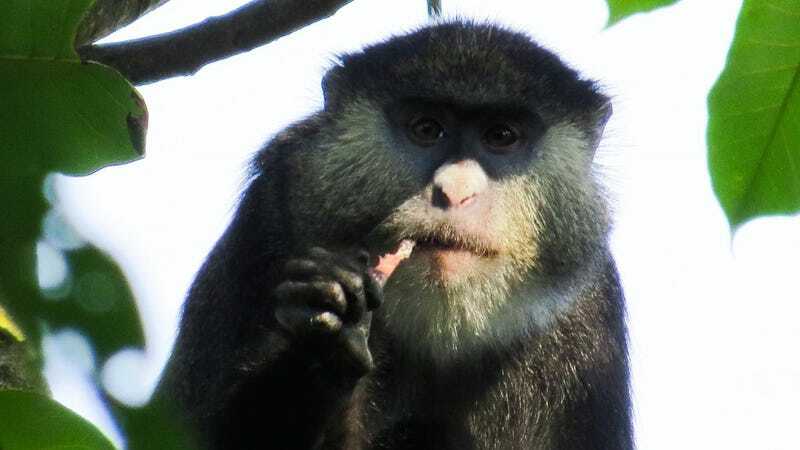 “Our study found that Cercopithecus monkeys opportunistically preyed on bats not only in Gombe, but also in the Kakamega Forest in Kenya,” said Kate Detwiler, co-author of the study and an assistant professor in FAU’s Department of Anthropology. The researchers say the persistence of these monkeys to capture their prey indicate that the bats are a valuable item in their food repertoire. All of these predation events occurred along the forest-edge or plantation habitat, suggesting that loss of habitat may play a factor. “While effects of habitat change on bats are unknown and merit further study, our observations suggest that Cercopithecus monkeys preying on bats may be habitat specific, and possibly affected by anthropogenic habitat changes,” said Tapanes. So there is yet another reason to mitigate habitat loss in these sensitive areas.